It may have been brief, but it was beautiful. The Czech Republic side of Euro 2004 was brilliant, because they had everything in an attacking sense. They had an aerial threat from 6′7 Jan Koller. They had pace upfront from Milan Baros. They had the finest footballer in Europe at the time in Pavel Nedved, and Poborsky and Rosicky who could play either centrally or wide. They had a deep playmaker in Tomas Galasek, and two rampaging full-backs who got up and down the line all day. When teams are one-dimensional, it’s easy to put in place a system to stop them. When a side like the Czechs have so many options going forward, it’s almost impossible, and that’s why Karel Bruckner’s team were great to watch. Add the best goalkeeper in the World and two strong centre-backs, and the Czechs were incredible. The reason Bruckner could afford to play two strikers and three attacking midfielders was because none of those midfielders were passengers when the Czechs didn’t have the ball. 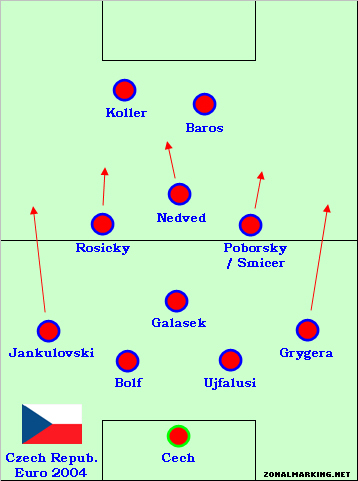 Rosicky, Nedved and Poborsky were all hard-working players, and therefore the Czechs were never outnumbered in midfield. This team has the honour of winning the finest game of the decade, a 3-2 win over Holland after the Dutch had led 2-0 after 20 minutes. That night demonstrated Bruckner’s attacking instincts wonderfully. At 0-2 down and the defence falling apart, Bruckner prepared a substitution. The right-back, Grygera, was due to be withdrawn, with a winger, Smicer, set to replace him. As the change was readied, the Czechs scored, to make it 1-2. 65 minutes to go, and only a goal down. Did Bruckner still make the switch? Of course he did. That gave the Czechs the majority of possession, but they couldn’t score another. And then Bruckner went even further, taking off the holding midfielder Galasek on 62 minutes and putting on Marek Heinz, another forward. And so the Czechs had three forwards, four attacking midfielders, another winger at full-back, and two centre-backs. The most remarkable thing? The Czechs had won their opening game, whilst the Dutch had drawn. This wasn’t do-or-die: a draw would have suited the Czechs fine. But Bruckner refused to settle for a draw, and his side equalised through Baros. The game of the decade was won two minutes from time, Poborsky unselfishly teeing up Smicer, and the Czechs had qualified from that competition’s Group of Death with a game to spare. Bruckner changed the whole side for the final game, against a German side needing a win to progress. And, incredibly, confidence in the camp was so high that the Czechs still beat the Germans. They breezed past Denmark 3-0 in the quarter-finals, before coming up against Greece. And, of course, that was where it all went wrong. Nedved (who was the European Footballer of the Year at the time) having to leave the game through injury after 40 minutes remains one of the most frustrating moments of modern times, for he was the heartbeat of this team. And, of course, his teammates didn’t get there either. 52% of possession and 16 of the game’s 23 shots was not enough – the Czechs couldn’t score, and the only meaningful ’silver goal’ in history settled the game. Pretty much the same XI turned up for World Cup 2006, and they started with a convincing defeat of USA, but red cards against both Ghana and Italy were their downfall, and they were sent packing. By Euro 2008 they were over-the-hill. They failed to qualify from the weakest group ahead of the 2010 World Cup, and the 2004 glory team are a distant memory. On an entirely personal note, this was my favourite team of the decade – watch them coming from behind against Holland in that incredible game that featured 36 shots, 21 of them on target. A great side. I’ve always felt that Rosicky is much more effective in a more central role, giving him the option to drift wide if he wants to, than in a wide starting position, where Arsenal have been using him in recent weeks. The real downfall of the Czechs at WC 2006 was Koller’s injury. It came with them already ahead against the US and so they were able to look good in that game playing off the counter using the pace of Baros. However in games that started 0-0, without Koller they didn’t have the targetman that makes possible all of the movement and dynamism that takes place around him. Second to Nedved’s injury in 2004 was Koller’s in 2006. That clip is made amazing by the fact that the commentator seems to be actually trying to mispronounce all of the players names. Thank you for including this outstanding side in this list. It is also brilliant to hear that this team is a personal favourite of yours. I have been championing the Czech 2004 side consistently since the European Championships that year and hold them in such high esteem I rate them as my favourite side in the past 10 years or so without even blinking an eye. One of the most well organised and exciting teams I’ve ever had the pleasure of watching. The devil may care attitude of Bruckner enlightened the whole tournament that year for me and were a revelation. What I personally found so engaging was that the side was able to not just display obvious natural talents in Nedved or Rosicky but was able to demonstrate their ability in such a well organized way. That side could for me have beaten any of the top sides over the last 10 years and as you so expertly put, the sheer variety of options available for them in one formation was staggering. Milan Baros, whom most would agree is a more than capable footballer was made to look a world beater in a carefully and well crafted team, and as a result became linked with Real Madrid. Unfortunately beyond the first team, and one or two changes the side lacked the depth of talent that the greatest teams have got. It was painful to see them go out to the Greeks (who of course themselves were a fine example of where the right tactics can take you) and also the demise of the side over the next few years. I am yet to see a club or international team that has captured my imagination in the same way that the Czech’s did back in 2004. The Barcas, the invincibles, the Spains, the Brasils. None of whom have turned my head like they did. The only fault aside from their strength in depth for me, was how they made me believe that they could sustain the side. Because of this outstanding outfit I now care more for the Czech Republic than any other side in world football (bar of course England and my club team) on the completely unrealistic thought that they can one day play like the side of 2004. Foolish, of course, but that’s what a team like that can do to someone. Great post, I agree with everything you say. Had they gone on to win the tournament they would have been top of this list, just a shame they couldn’t get past Greece. What are your thoughts on the current Czech side? I haven’t seen them since Euro 2008, but just looking at their squad list, they seem relatively weak these days, which is a terrible shame. Thanks, but it was a delight to read a dissection of such a great side. If they had gone to win the tournament (which they easily could have) they would be classed in that category of all time great teams and we wouldn’t be discussing them as nearly ran’s. I’ve watched sparse offerings from the recent Czech side but what I have seen they are now a distinctly average European middleweight side. With the ageing of key players and the departure of Bruckner the team has fallen into disarray. Since 2008 they’ve had 4 different managers, kicked out half their team and have failed to put in a performance or result of note in any game. In fact their last game was a 1-0 defeat to Scotland which can only highlight how far they have fallen (with the greatest of respect to an ever improving Scotland side). Honestly the current side haven’t a hope. The team has become a nightmare. And for lack of a better way of explaining it, the international equivalent of Leeds or Portsmouth if you will. I too am glad you included this team. It certainly was my favourite for the tournament. It is incredible that their holding midfielder and the only true defensive element in midfield was the short and lightweight Galasek. Additionally the entire defense in Jankulovsky, Grygera, Ulfalusi and Rozenhal (who I remember as being the other centre-back) are players who have displayed frailities on various occasions. It must have taken considerable courage and single-mindedness to play such an offensively strong and defensively susceptible line-up. Some other teams I hope to see make the list : Argentina 2006, Dynamo Kiev-Lobanovsky 1999 (I guess they cant be included in this decade, which is a pity), Spartak Moscow (2000 or 2001), Portugal 2000 and of course Barça 2006, 2009. Great article, even better website, really impressed with the thought you put into this (not patronising). I’m glad you gave credit to Pavel Nedved who imo is one of the greatest players ever. A hard-working two-footed attacker, Man Utd’s decision to buy Veron ahead of Nedved must rank high upon SAF’s regrets…an absolutely awesome player. Couldn’t have wrote it better by myself. Great article and great website. Pavel Nedved is also one of my all-time favourites. Too bad he got injured against Greece and got an uneccessary yellow card in the final moments of CL semis so he couldn’t play in the finals. The previous comment about saf regretting buy Veron instead of Nedved is interesting. I for one regard him as a great player who then united of that time weren’t able to adapt to(vice versa). I personally think he would’ve have been awesome in the 07-09(Ronaldo and Tevez years) playing in the in Carricks role.That united team was much more flexible than the one he played in,especially the front 3.The Midfield was great tho! ZM,what do u think?